Kuba Bakowski in Xiamen designed and printed street stickers with a writing: "I was here"
Into the writing Bakowski incorporated the miniature photo figures of himself. The street stickers were used to carry out an extraordinary artistic action in the Wuyishan Mountains. The TV Zero Zones project consisted in nightly broadcasting of four video-animations (one a night) on the TV test-card of polish National TVP2. 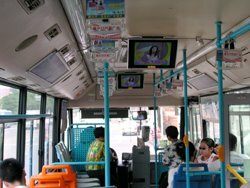 The "TV Zero Zones Xiamen Project" consists in the artistic interference into advertisement sets displayed on LCD screens in Xiamen public busses. The 4 video clips under 1 minute will be shown to Xiamen passengers in the public busses during few days at different time as an interval between music clips and commercial advertisements.